In the face of mass deforestation of the Amazon, recent findings indicate that we could learn from its earliest inhabitants who managed their farmland sustainably. An international team of archaeologists and paleoecologists, including Dr. Mitchell Power, curator of the Garrett Herbarium at the Natural History Museum of Utah and assistant professor in the Department of Geography at the University of Utah, report for the first time that indigenous people, living in the savannas around the Amazonian forest, farmed without using fire. These findings are published today, April 9, 2012, in the journal Proceedings of the National Academy of Sciences. The research could provide insights into the sustainable use and conservation of these globally-important ecosystems, which are being rapidly destroyed. Pressure on the Amazonian savannas today is intense, with the land being rapidly transformed for industrial agriculture and cattle ranching. By analyzing records of pollen, charcoal and other plant remains like phytoliths spanning more than 2,000 years, the team has created the first detailed picture of land use in the Amazonian savannas in French Guiana. This gives a unique perspective on the land before and after the first Europeans arrived in 1492. The research shows that the early inhabitants of these Amazonian savannas practiced ‘raised-field’ farming, which involved constructing small agricultural mounds with wooden tools. These raised fields provided better drainage, soil aeration and moisture retention: ideal for an environment that experiences both drought and flooding. The fields also benefited from increased fertility from the muck continually scraped from the flooded basin and deposited on the mounds. The raised-field farmers limited fires, and this helped them conserve soil nutrients and organic matter and preserve soil structure. It has long been assumed that indigenous people used fire as a way of clearing the savannas and managing their land. However, this new research shows that this was not the case here. Instead, it reveals a sharp increase in fires with the arrival of the first Europeans, an event known as the ‘Columbian Encounter’. The study shows that this labor-intensive approach to farming in the Amazonian savannas was lost when as much as 95 percent of the indigenous population was wiped out as a result of Old World diseases, brought by European settlers. The results of this study are in sharp contrast with what is known about the Columbian Encounter’s impact on tropical forest, where the collapse of indigenous populations after 1492 led to decreased forest clearance for agriculture, which in turn, caused a decline in burning. 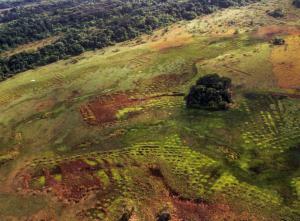 This study shows that high fire incidence in these Amazonian savannas is a post-1492, rather than pre-1492, phenomenon. The study was carried out by a team from the University of Exeter (UK), Natural History Museum of Utah (US), Centre National de la Recherche Scientifique (France), University of Edinburgh (UK), Université Montpellier II and Centre d’Ecologie Fonctionnelle et Evolutive (France). It was funded by two CNRS Programmes (‘Amazonie’ and ‘Ingénierie Ecologique’), the Arts and Humanities Research Council and The Leverhulme Trust. The research featured in the PNAS article highlights two areas of active research at the Natural History Museum. During the past four years at the Natural History Museum of Utah, Dr. Power has been developing a modern pollen reference collection based on vouchered specimens archived in the herbarium collection. The majority of the plant specimens in the herbarium collection were collected during their period of flowering, thus the Museum plant collection provides opportunities to study the plant ecology such as the timing of flowering as well as the pollen morphology for each species. Pollen is preserved in lakes and bogs for thousands of years and the ability to identify plants through there pollen, has allowed Power and this international team of scientists to document the types of crops and natural vegetation present thousands of years ago when raised-field farmers occupied the savannas of coastal French Guiana. This is from coastal regions of French Guiana – very certainly not `Amazonian’. The raised-field farming techniques are already well-known from wetlands in the region (for example, Farrington, I. (ed.) (1985) Prehistoric Intensive Agriculture in the Tropics. British Archaeological Series, International Series, no. 232, Oxford, UK. Fire is not normally used on these permanent beds. While savannas may be burned regionally it is not for agriculture – soils are too poor (in contrast to `mucky’ wetland soils). The original article mentions `swidden’ otherwise known as `slash-and-burn’ but this is not used on savannas, only on bush or forest (the ash from which provides the needed nutrients). Also, swidden is by definition `shifting cultivation’ whereas raised-field is permanent (although mounds are often rebuilt each year). The whole article has nothing to do with `mass deforestation of the Amazon’: it simply revisits a well-known wetland management technique for agriculture.